The Cast Chrome Sender SDK lets you extend your Chrome app to control media, including video, movies, music, and games, on a TV or sound system. The Cast Chrome Sender Framework API provides a wrapper for the lower-level Base API. This framework simplifies and streamlines writing sender applications. The framework provides a simpler way to manage the Cast session and state, a Cast button implementation, and data binding to simplify implementation of a Cast remote player. This guide describes how to register your Chrome sender app and provides other information useful setup. The Google Cast Chrome Sender SDK is provided natively in Chrome. Updates to Google Cast occur automatically for all users, and provide fixes, user-facing features, and SDK capabilities. Updates are backwards-compatible, and should be transparent to your site. Note: Chrome has been enhanced so that it no longer requires a Cast extension. The Cast Chrome Sender SDK that is loaded by a web page is backward compatible with the SDK previously provided by the Cast extension. Warning: Chrome sender apps need to support HTTPS to maintain Cast compatibility, as Chrome is deprecating support for the Presentation API on insecure origins. Other than registering your application and device, no special setup steps are required to use the Google Cast Chrome Sender SDK. As long as you have the latest version of Chrome, it is possible for your web content to access and use the SDK. Follow the steps at Registration. Once you have your application ID, you're ready to develop your application. 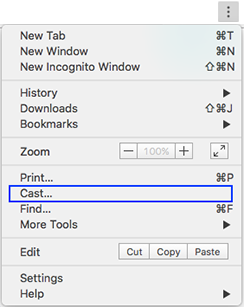 While your Chrome sender app should have its own Cast button, a user can also invoke the cast feature by choosing Cast from the Chrome menu, as shown here. Your Chrome sender app should handle both cases. Users can also optionally install the Google Cast toolbar icon in order to get direct access to Google Cast functionality without having to use the Chrome menu. A public beta channel for Chrome is also available. New versions of Chrome are pushed to the beta channel prior to a full release; the beta channel is also updated more often than the stable channel. This gives developers (and passionate early adopters) advance access to new features, and allows you to ensure that your site works with upcoming versions of Chrome. To report issues, with the Google Cast toolbar icon installed, right-click on the Cast toolbar icon and choose "Report an issue". We can’t respond individually to most feedback, but we greatly value the input on the beta channel. Before pushing updates to your live site, ensure that you test with the current stable version of Chrome. Most visitors to your site will have the stable version of Chrome installed, and if you depend on beta-only features, users with the stable version will be impacted.